No reading required with the stylish COOLPIX L30. It captures the shots you want, the way you want them, with little more than the push of a button. Just pull it out of your pocket or purse, zoom in with the power and clarity of a genuine NIKKOR glass lens and catch detailed 20.1-megapixel close-ups. A smartly placed Movie button means you won't have to take your eyes off the large LCD to start recording HD video, and an anti-reflective coating helps to ensure you'll have a clear view, even on bright sunny days. Easily add fun Image Effects, overcome difficult shooting situations simply by selecting a Scene Mode, say goodbye to red-eye and blinking in your portraits, plus much more. Bring home great photos and videos. The COOLPIX L30 is so easy to use, anyone can take great photos and videos with it. Just turn the camera on, point, shoot and marvel at the results. For maximum point-and-shoot convenience, select Easy Auto Mode. It automatically optimizes the camera settings for each shot, no matter how challenging the situation. You'll be free to enjoy the moment while you capture it. Experienced photographers optimize their camera settings to match the situation. 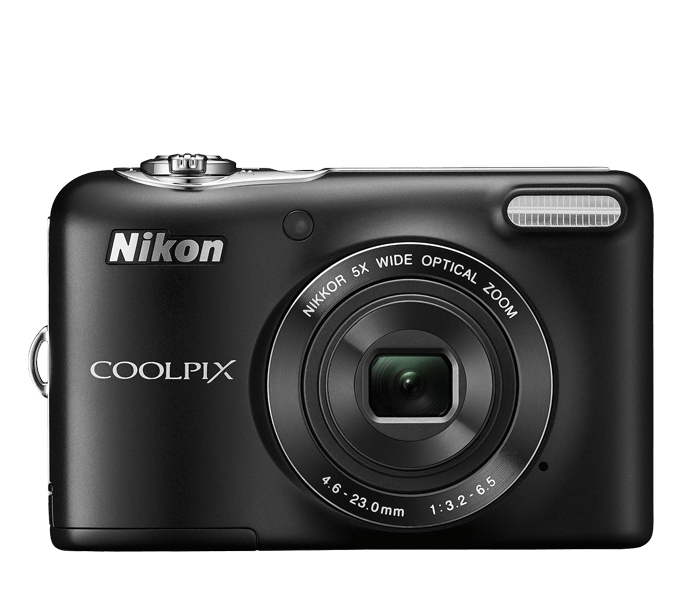 The COOLPIX L30 does that work for you. With 17 Scene Modes, including Beach, Snow, Night Portrait, Sunset and more, it's easy to match the moment to a Scene Mode. You can even get creative and use Scene Modes to alter ordinary shots. Or, select Easy Auto Mode and let the camera choose the best mode for your situation. Every COOLPIX is designed around a genuine NIKKOR glass lens, the legendary optics that have made Nikon famous. The COOLPIX L30's 5x Zoom NIKKOR lens is great for everything from wide-angle group shots to close-up portraits. Plus, Electronic Vibration Reduction helps keep every video steadier, even if your hands are not. The COOLPIX L30's large, 3-inch LCD display makes it easy to compose your shots or monitor your video recording. Reviewing and sharing your creations is a pleasure, too—every shot looks fantastic on the display.